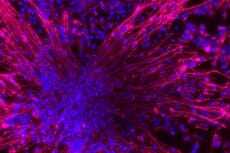 It just takes the repression of one protein to directly transdifferentiate skin cells into functional neurons according to a new study in Cell. Xiang-Dong Fu with a team of UCSD and Wuhan University scientists demonstrated that micro-RNAs silence a protein, which is sufficient to convert adult skin cells into neuron-like cells. The researchers are hopeful that this technique could lead to new drugs to treat degenerative diseases.